Would you like to know what your donors are saying about you in social media? This integration will allow you to easily search by the donor’s email address for their Facebook, LinkedIn, and Twitter accounts and store them in DonorPerfect! 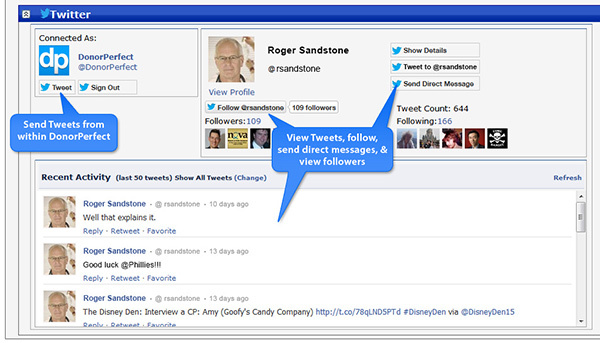 Plus, as long as you have a Twitter account, your donor’s Twitter feed will display in DonorPerfect. Now you can keep up-to-date on all of your constituents’ recent activity and information, as well as keep in touch with each of them personally. Plus, you can reach out to your most connected donors by tracking who has the most friends or followers on Twitter. For example, someone who may not be your target for a major donation could be the perfect person to help spread your communications (upcoming events, new campaigns, breaking news, etc.). Our intention was to include more Facebook functionality. However, before we could complete its development, Facebook changed their rules for app developers (such as DonorPerfect), which made continued development of this feature an impossibility. If you would like to have fundraising insights from Facebook in programs like DonorPerfect, please tell Facebook your ideas directly. Call 1 877 938.1221 or click here for a FREE consultation.